Spells now have the same mechanic as the creature abilities. If it’s effect tries to exceed the card limit, the new card will get destroyed or nothing will happen. In some cases the spell can’t be played. 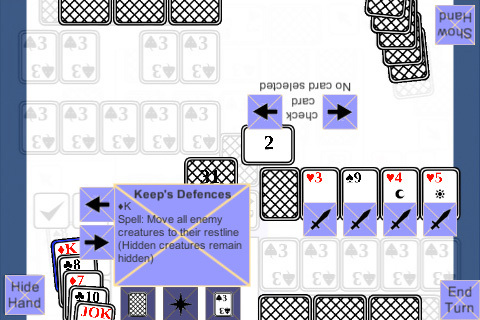 The screenshot shows an example of a spell that is supposed to take control of an enemy creature. Since the player already has 5 creatures out, the graveyard shows a count of 2, the spell and the creature it targeted. The ability animation will now play before battle starts. What’s next: back to testing.